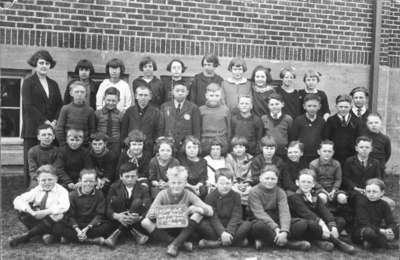 Black and white negative of a photograph of the students from room 4 at King Street School. The photograph was taken in front of the school. Back row: William Johnston, Elsie Norman, Florine Campbell, Ruby Ward, Oda King, Beatrice Graham, Marjorie Heard, Ethel Threadgold, Dorothy Grylls, Mollie McKenzie. Third row: Fred Harris, Ian Davey, ____ Hill, Unidentified, Jason Bedding, William Graham, ____ Sleeman, Ben Sleep, Frank Every, ____ Sawdon, Arthur Moore. Second row: Unidentified, Unidentified, Bob Clarke, Dorothy Rice, Jean Mathison, Alice Threadgold, Maude Parks, Elizabeth Sawdon, Irene Hartrick, Unidentified, Mack Bassett, James Dundas. Front row: Percival Rodd, Unidentified, Jason Bryant, Stanley Jones, Tom Sawdon, George Bedding, Clifford Maundrell, Bob Campbell. King Street School was built in 1921 on the block bounded by King, Dunlop, Henry, and Gilbert Streets. It was built to replace Henry Street School which burned down in 1920. In 1979 it was renamed R.A. Sennett Public School in honour of its first principal who served from 1921-1952.